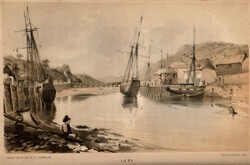 As well as the base for Shadow Tor Studios, East Looe is a delightful town with a working harbor. The town's main industry is scallop, shark and mackerel fishing. In summer, Looe offers the 'traditional' English summer holiday, complete with masses of sunburnt tourists, endless ice-cream and even Punch & Judy shows. The 'English summer holiday', is a desired taste, so we are thankful that the quieter months of winter offer bright full moons, eerily quiet nights and roaring fires in timbered pubs and inns. Many a ghost story, legend or gruesome tale has been told in these cozy nooks. Grab yourself a pint of deep local ale, pull a stool up next to the old fireplace and soak up the Cornish magic. At times, should the mood be right, you can feel time moving backwards and standing utterly still. 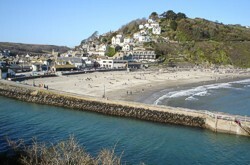 Daytimes in Looe offer much in the way of interest, from local ancient sites to long coastal walks. Within minutes of leaving the main town you can find yourself utterly alone. It's perfect for short breaks, time for contemplation and photographing the landscape undisturbed. and here and there a cottage peeps out of the trees. and the myrtle flourishes close to the sea shore. in mazes of little narrow streets. beautifully closed by the English Channel. Getting there: Looe has both a train station, and several good bus routes. Trains from London's Paddington Station take around 3-4 hours, and depart hourly. 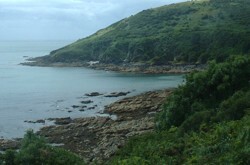 Disembark from Liskeard, and jump in a cab to Looe, or catch the scenic Looe Valley Line train along the swamp lands and estuary of the two Looe rivers. Map interests: The rugged coastline is clearly indicated, as well as the museum and landmarks. The celtic chapel of Lammana is located just beyond Hannafore to the south west, and is easily accessed. Just off the map, to the south, is the Island dedicated to St.George. A few lonely houses, (now empty), were once the haunt of smugglers & pirates. Would you expect anything less.